If your organization focused on implementing best practices in every area where it counted, in a short amount of time, you would probably have a very successful organization. The reality is organizations typically don’t systematically focus on implementing best practices. Often it is simply due to a lack of awareness of what the best practices are in a given function. This naivety won’t cut it in today’s world where some of your competitors are soaking up and adopting every possible best practice to drive their advantage. Best practices are another one of those tools that I use early on when engaging with a new team or organization. Identifying weak practices and the path to best practices is relatively easy and quick value-add. It also builds muscle in an organization when it comes to improvement and change. A best practice is a way of doing things that produce superior results relative to the existing practice. Established best practices are often dethroned by emerging innovative practices, so for the sake of simplicity, we will combine emerging practices into best practices. You can apply best practices to just about every aspect of an organization. Now let’s go over some examples and how you can discover and implement best practices. 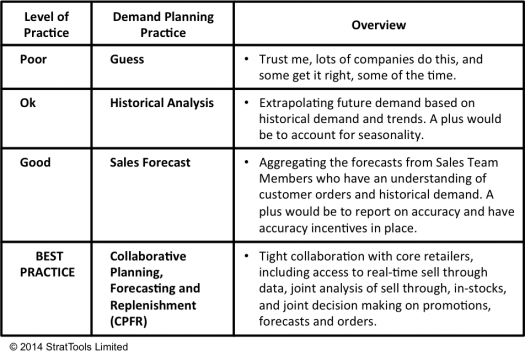 In the 90’s, Walmart created collaborative planning, forecasting, and replenishment (CPFR), which has become the best practice for demand planning. It makes all the sense in the world on why it is the best practice. The combination of retail sell-through data, collaboration on analysis and planning, and coordination of promotions, leads to much more accurate forecasts and demand planning. And, of course, there are best practices within CPFR and widely different levels of execution of CPFR. But, in the end, collaborating with your customers on demand planning is a best practice. How do you discover and implement best practices? There are associations for every function and every industry, and many of them have conducted research and codified the learnings on best practices in their function or industry. There are also pretty expensive groups like the Corporate Executive Board, a member-based advisory company that collects and shares best practices from member companies. Best practices fuel the content of business, management and technology magazines and websites. As you read them take note of cool ideas that startups and growth companies are pioneering and see if they can apply to your organization. It is pretty easy to figure out the best customer-facing practices for a particular process. Pick the best customer-oriented organization in your industry or other industries, and go through their customer journey, auditing and deeply understanding their best practices. Many online SaaS platforms have baked in best practices for many processes and reports. Implement Salesforce.com, if you want to adopt sales pipeline best practices. Implement Intuit’s QuickBooks, if you want to adopt many accounting best practices. It isn’t quite as easy as that, but it always serves as a good start. For larger companies with lots of people doing similar things, there is most likely some amazing best practices. At Sports Authority, we would conduct contests for best practices like the best opening lines for talking to customers, or the most efficient way to unload a truck. There were always great ideas and practices. Use the Deming Cycle and PDCA framework to see if the best practice beats your current practice. Plan the change, Do and test the change, Check to see if the change made a difference, identify the learnings, and Act on what was learned.